Rubber floors are making a bit of a come back as the need for a cushiony surface increases. They can be put down as tiles, a coating, a coin textured surface, or even as matting. If you’re looking for a durable and environmentally friendly flooring choice, then rubber floors may be the right selection for you. One big question though is whether rubber is a natural material or man-made? It can be either. Virgin rubber is made from the sap of Rubber hevea brasiliensis trees, initially grown in Central America, but now farmed in rain forests around the world. Synthetic rubber is made of polymers derived from the petrochemical industry. And there are blends of natural and synthetic rubber, maximizing the strengths of compound. The first rubber floors tiles were used as early as the twelfth and thirteenth century, but the popularity began to decline in the seventeenth century when red clay tiles came into vogue. However, as the industrial revolution occurred and a need for more resilient flooring increased, rubber flooring returned to the mainstream with a patent by Frank Fumess in 1894. As improvements happened, the flooring became easier to clean and more durable, though it tended to stain over time and couldn’t be used in high humidity rooms. The good part about rubber floors is that they can be used throughout a room, a large area, or in a small space. Some retail establishments use small rubber floor mats to cushion workers who have to stand for long periods of time, people like cashiers, food service workers, and factory workers. And for the everyday home, they can be a great addition in a kitchen (so long as you’re not prone to animal fat spills because animal fat can eat away rubber). Rubber floors reduce noise, perfect in a noisy household. And if you have children, the floor is quite capable of resisting anything they can throw at it. Most spills mop right up and stains can fairly easily be brushed away with a wire brush. Regular cleaning and mopping keeps the original color and texture of your rubber flooring. Installing rubber floors is something that an average homeowner can complete without too much expertise. If there’s a playroom or a workout area that you want to make safer with rubber floor tiles, you don’t have to call a team to do it for you. A rubber floor provides a non-slip surface for athletic flooring as well. Rubber gym floors work especially well because it cushions falls, reducing major injuries. A coin textured rubber flooring system only further reduces slipping, and adds an interesting look to a room. 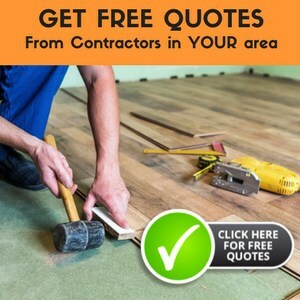 Society is also becoming more aware of its need to find flooring surfaces that can be made from recycled materials. Rubber tapped from the rubber tree is a sustainable product, as long as rain forests aren’t destroyed by planting rubber tree plantations. There are more tires in landfills than ever, and some companies have found they can be recycled into beautiful rubber floors. Not only is this helping the environment, but also it’s creating safe surfaces for everyone that uses them. If you’re looking for a floor that will provide comfort, safety and quality, rubber floors may be for you. I posed this question in another post: Can a rubber floor (the kind with the raised bumps) be painted? I just got an apartment and the rubber floors in the kitchen and bathroom are very ugly. I thought perhaps I could paint them as a quick cheap solution? Is that possible? Good question Michelle! I don’t see why you can’t – you’ll just have to make sure that the paint isn’t going to have a chemical reaction with the paint. After painting, you should also seal it with a product like Diamond Coat Varathane Polyurethane. Another alernative -and maybe better- may be an epoxy paint. I’ve never known anybody to paint over a rubber floor, and I’ve never done it myself, so I feel like my answer is less than educated to say the least.